Hilda Warner, 74, of Quincy, FL, departed this life on Friday, February 2, 2018. She leaves to cherish her precious memories: sons, Kenneth (Taniara) Warner and Steven (Cassandra) Warner; daughter, Sherri (Paul) Kavuma; brothers, Michael (Patricia) Williams and Gregory Williams; sisters, Connie Jones, Annie Hicks, Carol Stream, Jacqueline Williams and Sandra Woodley; a host of grandchildren and great-grandchildren; and a host of other relatives and friends. Visitation will be held on Friday, February 9, 2018, 4-6 p.m., at the mortuary. A service of celebration will be held on Saturday, February 10, 2018, 1:00 p.m., at Kingdom Hall of Jehovah's Witnesses, 8121 Havana Hwy, Havana. Interment: Sunnyvale Cemetery, Quincy. WILLIAMS FUNERAL HOME is providing services for the Warner family. To plant a tree in memory of Hilda Warner, please visit our Tribute Store. 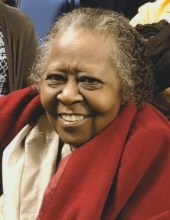 "Email Address" would like to share the life celebration of Hilda Warner. Click on the "link" to go to share a favorite memory or leave a condolence message for the family.